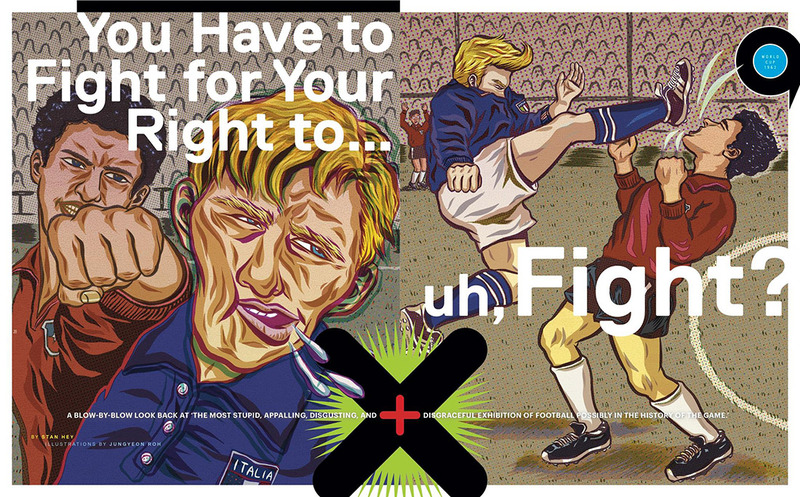 Below has the illos I did for the issue, and was about ‘The Battle of Santiago’ during the 1962 World Cup. A match that was “the most stupid, appalling, disgusting and disgraceful exhibition of football possibly in the history of the game”. Super nice layout with the fonts! 8×8 is the most beautifully designed magazine I’ve ever saw! Look at the referee Kenneth Aston! I forgot to post the work I did for the issue #01 here. I created an image of a Belgian footballer Marouane Fellaini who plays soccer in England as a giant black poodle. Posted on March 10, 2014 by Jungyeon Roh. This entry was posted in Editorial, Magazine, portrait and tagged 8 by 8, 8x8, basketball, eight by eight, grantland, Marouane Fellaini, NBA, Philippines, Priest and Grace, soccer, sports. Bookmark the permalink.